The S&P 500 hit its market bottom in March 2009. Since those lows, the S&P 500 has rallied 334 percent in the longest stretch on record since World War II without dipping into a bear market... and that is worrying Robert Shiller. 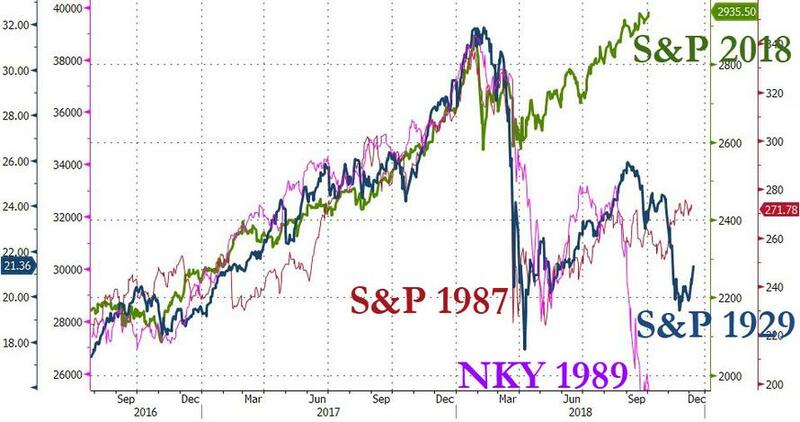 As CNBC reports, the professor of economics at Yale University and Nobel laureate says the steep run-up in this market rally is similar to the excesses of the 1920s before the October 1929 market crash and Great Depression. As a reminder, from the beginning of 1928 to Black Thursday on Oct. 24, 1929, the S&P 500 surged nearly 50 percent. Over the next five days, the index plummeted 23 percent. It had reached an all-time high just a month before the crash. "The 1920s is quite a legend that people are often thinking about," Shiller said Friday on CNBC's "Trading Nation." "I look at 1929 particularly as the end of the roaring '20s and it ended in a bout of speculation. Between May and September of '29 the stock market went up over 30 percent in just a few months." "At that time it seemed like it was a kind of gambling. The word gambling was used a lot to describe the market at that time so it became vulnerable. We're not exactly in that circumstance but we do have the market that has surged since 2009 so there is something of that spirit today," he said. "It's something about capitalism and the advancement of people willing to take risks. We have a role model in the White House who models that," said Shiller. "Something like that has driven not just the stock market but the whole economy up in the United States and makes the United States the most expensive stock market in the world." "It was a similar story that was boosting the market but they don't last forever and eventually the story starts to wilt," he said. "It's animal spirits — people's excitement about the stock market, bitcoin and other things."